Villa Gloria is a completely renovated house located three car minutes from Palm Beach, five car minutes to the Tierra Del Sol golf club in the quiet area of Boroncana.This gorgeous Villa has three bedrooms. Each bedroom has its own air conditioner and TV equipped with Netflix. The beds are equipped with high-quality linen and high-end mattress. The master has a king size bed and the other two are queen-sized. The gourmet kitchen is fully equipped with all the best appliances, including a wine fridge and a full spice rack.The living room has a plasma TV with Netflix and is fully air-conditioned. Villa Gloria is a tastefully decorated house which has the feel of the Caribbean. The bathrooms are fully equipped with hot water and glass showers. The property is tastefully landscaped with a private pool. In the backyard oasis, there are loungers, umbrellas, there is a shaded patio with island breezes to enjoy breakfast, lunch or dinner. There is a Weber barbecue with a Searing station connected to the main gas. You can relax in a comfortable patio set in the shade arbor. There’s a washer and dryer in the Casita. The owners have a nice size collection of books in case you like to read which includes both his and her selections in fiction and travel. The property is fully fenced in for privacy. The house provides WiFi and enhanced cable with Netflix to keep you entertained. The house is three car minutes from the Ritz Carlton in the famous Palm beach hotel zone. This area has numerous restaurants, shops, casinos and cinemas to enjoy your stay in Aruba. The food shopping stores Super Food and Ling and sons are only 8 car minutes away. The famous Malmok and Arashi beaches, for snorkeling, are only 5 to 6 car minutes away. You will truly be in the heart of the action by choosing this villa and you are bound to enjoy yourself. The total rate includes 15% tax / service charge, including final cleaning, an allowance for water and electricity in the amount of US$ 21,- per night and Wireless Internet. Over usage of utilities, shall be to your discretion and at your expense. Upon arrival a refundable security deposit is required of US$ 400,-. Mid term rentals exclude water and electricity. Located in a quiet and beautiful residential area. Three bedrooms, two bathrooms, fully renovated. All bedrooms, living and dining room fully air-conditioned. Private pool and backyard oasis with barbecue. Me and my husband stayed at villa Gloria for 2 weeks in September, 2018. The villa is perfectly maintained - a newly renovated house in the heart of the island. It is very well equipped and lovely designed for a relaxing and peaceful island escape - outside patio with a dining alfresco and a BBQ near the pool. It is a short drive (you will need a car) to any part of the island - shops, restaurants, hotel zone, and the most amazing beaches in the Caribbean. The interiors are perfect - open floor living, dining room and kitchen with brand new high end furniture and appliances. All rooms (although we only occupied one of the 3 bedrooms) are air-conditioned with a flat screen (wall-mounted) TV's in each room + 1 TV in the living room. The master bathroom is en suite with a double sink and a nice walk-in shower. Villa Gloria was simply the best. We rented for 2 weeks, 4 adults and 2 kids. The house is very well equiped and furnished. Beds are very comfortable and the living areas are well designed. Our favorite place to hang was definitely the pool! I would definitely recommend Villa Gloria to friends and family. We want to thank AHR team for their quick response when needed.They made our stay worry free. My husband and I stayed at Villa Gloria for 10 nights to celebrate my 40th Birthday! Villa Gloria is a beautiful home and has a lovely yard and pool. 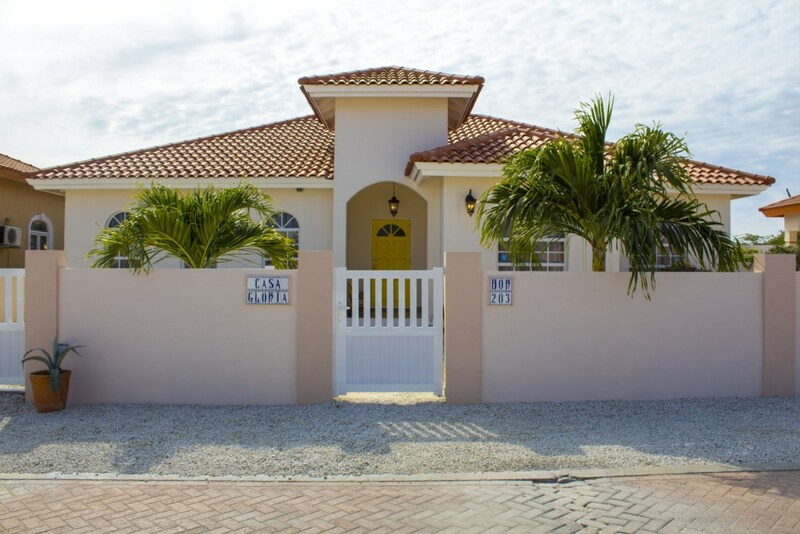 It is located in a quiet neighborhood very close to beaches and restaurants. We very much enjoyed our stay and hope to come back next year! We did have a little confusion with the lighting and never did figure out how to work the backyard lighting. We would have made more use of the pool if we could have turned on the lights. Having the opportunity to stay in this beautiful, expertly maintained home was such a delight. The location was perfect,close to all amenities but with a private non touristy feel. The fabulous backyard, with pool and lounge area was amazing for our family. I highly reccomend this property for anyone that is looking for a high quality, beautifully decorated rental with every possible in-house comfort you could ask for. This house is so beautifully decorated. The quality of the furniture and the beds is superb, I was very satisfied with the decorations as well. The back of the house is very private and has a pool with loungers, a outdoor couch area and an outdoor dining area, this was perfect for us and our children. I most certainly plan on returning next year.